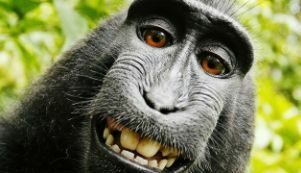 The U.S. Chamber Institute for Legal Reform (ILR) issued its "Top Ten Most Ridiculous Lawsuits for 2015" on Monday with an animal rights group’s suit involving a monkey’s "selfie" photo topping the survey. The ILR's released its list, including a video of highlighting each case, to raise awareness about frivolous lawsuits. As well as the group suing on behalf of a monkey, the list of trivial lawsuits includes a variety of scenarios. In New York, an 8-year-old’s aunt sued him for an overly exuberant hug that hurt her; two Manhattan women suffering superficial scratches and resultant “trauma” from a distant explosion in New York City’s East Village raised a furor with their filing, not being among the two people killed or the 22 others severely wounded. A California bank robber sued over injuries incurred while fleeing the scene of the crime. A Pennsylvania nursing student sued her school for not providing accommodations for her anxiety after twice failing a course. An incarcerated Colorado man sued the NFL when the Cowboys lost the playoff due to an overturned call. Two cases echoed a 1994 McDonald's case when a jury awarded a large sum to a burn victim. In North Carolina, a Raleigh police officer sued Starbucks after scalding himself with hot coffee that was given to him free. In California, a woman allegedly faked a similar injury by downloading Internet photos and presenting them as evidence. She in turn now faces 21 counts of fraud. In a Missouri restaurant where servers traditionally toss rolls to diners, a woman went to court claiming an eye injury; and in Florida, a woman tripped over a package left on her doorstep, so she filed against FedEx, arguing that she was not properly informed of the box’s proximity to her door. Want to get notified whenever we write about U.S. Chamber Institute for Legal Reform (ILR) ? Sign-up Next time we write about U.S. Chamber Institute for Legal Reform (ILR), we'll email you a link to the story. You may edit your settings or unsubscribe at any time.